Mold can grow in as little as 48 hours. Because growth can happen so quickly, mold can become an issue in your home or business when there’s high humidity. Mold causes damage to your property and can cause significant health issues to you and your family if not handled properly. Mold the silent invader grows on wet, damp surfaces. Mold is a fungus that is found everywhere, both inside homes and businesses and outdoors. Mold spreads and grows by making spores. Spores release into the air and can be carried by air, water, humans or pets to new locations. As stated above, mold thrives in moist conditions. These conditions can be created by slow leaks from water pipes, a burst pipe or high humidity in your home or business. 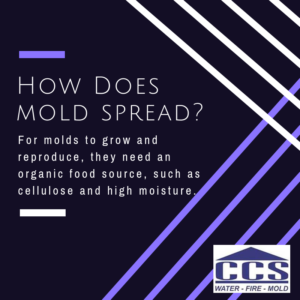 Mold not only needs moisture to grow but also needs a food source, oxygen, and temperatures between 40 and 100 degrees Fahrenheit. When these conditions exist, mold can grow from the mold spores. Keep an eye and nose open for mold growth in your home. A telltale sign of mold growth is musty odors or dark spots on your ceiling, floors or walls. If you can smell the mold and mildew you most likely have mold growing in your home. Is there condensation on your windows or metal surfaces? If there is, chances are good that mold could be starting to grow in your home if the condensation is consistently happening. Find the source of the high humidity in your home or business. The source of the humidity needs to be addressed quickly and fixed. Once this is fixed, the mold removal and remediation process can begin. It is important to note that you do not want to disturb the mold or blow air across any surfaces with visible mold growth. This will simply spread the spores to more areas and allow further mold growth if the humidity issue has not been addressed. Next, call us at 920.435.2288 for a FREE mold assessment. Our technicians are trained in proper mold removal and remediation services to help you remedy the situation. Don’t let mold the silent invader take over your home or business.